Every once in a while Snack Girl meets a fellow food blogger in person. I know it is hard to believe that I ever leave my cave, but I do from time to time. I was lucky enough to meet Jane at a Ladies Home Journal blogger event. Why do I like her? First of all, she helped me carry stuff a long way. Secondly, she has a wonderful blog called This Week For Dinner. Her food is healthy, her photos are beautiful, and she even made over ramen! Check her out. I love fast and easy recipes, I love food that tastes good, and I love being able to feed my family nutritious meals. When those three things come together, it's like a perfect storm of kitchen wonderfulness! Before we get to that perfect storm, a confession is in order. I love ramen noodle packs. You know, the 89-cent packages of ramen noodles paired with tasty broth packets that are oh-so-good and oh-so-devilishly-packed-with-sodium? I haven’t bought ramen in years because of that darn sodium. Happily, today’s recipe will let us have our ramen and eat it, too! Enter the perfect storm of wonderfulness, today's recipe for Asian Chicken Noodle Soup. 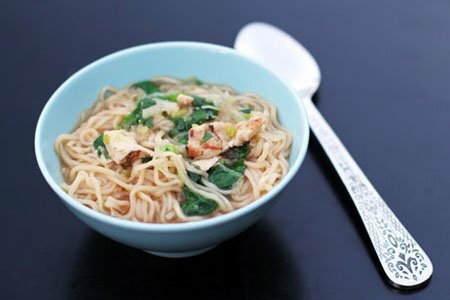 While you will need to buy one of those cheap-o packages of ramen for this recipe, you will also be throwing away the evil little flavor packet inside. Instead, we’ll use healthy, natural ingredients and just a bit of salt to create a yummy meal that’s perfect for kids, adults and college kids alike. This recipe is quick to prepare and should be eaten immediately, so plan accordingly! Heat vegetable oil in a large pot over medium heat. Add chopped white green onions (reserving the greens for later), ginger and garlic and cook for about 1 minute. Stir in chicken broth and soy sauce and bring to a simmer (you’ll want to turn the heat up to get it boiling gently, then reduce the heat to medium or so to maintain the simmer). Stir in ramen noodles and coleslaw and cook for 4 minutes. Add chicken and spinach and cook for 1 minute. Stir in the rest of the green onions and sesame oil. Mix together, taste, then add salt, pepper, soy sauce and sesame oil to taste. Serve immediately. Serves 4. Yum! I have some of those in my pantry and didn't know what to do with them. This sounds delicious! Can't wait to try it out. Ramen noodles are worst thing you can eat. The noodles themselves are coated in wax, they deep fry the noodles to preserve them, and the season pack forget about it. Also digesting them is very hard for you system. I heard a study done on them and then looked them up myself and was horrified. I used to buy them all the time. Now I only get them on thoughs weeks shopping cheap is how we need to get by. This sounds yummy although I had also heard that the noodles are deep fried - I guess if you are splitting up 1 noodle pack between 4 people it is not so bad. (but I'd surprised if you get as many noodles as in the picture). Would probably also be good with some chopped Cilantro. Snack Girl, could you share the URL for your new friend's blog? Whoops... never mind - I see that you did include the link! I think this looks good. Hubby is going away this week and it will be on my menu. This looks easy and tasty. However, the portion size seems very skimpy. One package of noodles divided into SIX one cup servings? Also, is the nutritional information correct? Does this recipe contain almost 1200 calories? I would probably end up eating half of it and it would be 600 calories. You're right Teresa, unfortunately the sodium content on this one is way off. Although definitely better tasting, this recipe isn’t significantly better sodium wise than the packaged types. My wife suffers from congestive heart failure, where one pack of ramen soup would send her into an intensive care unit. Her diet MUST remain below 1000mg (1 gram) of sodium daily. If I screw up, she suffers. The one tablespoon of soy sauce contains on average 1200+mg sodium (“plus extra as needed”), plus the added 'salt to taste', and the low sodium chicken broth (avg of approx 70-100mg/cup sodium)…and you’re almost right back at the packaged ramen soup levels. Even the "lower sodium" soy sauces contain ~900mg sodium/tablespoon. I simply make my own chicken soup stocks with lots of veggies and seasonings without salt, and go from there. Oh, a simply hint, citrus provides the same ‘mouth feel’ that salt does, which is why every salt free seasoning (ie Mrs Dash) uses lemon extract as an ingredient. And those bullion cube flavorings? Chuck those...each one exceeds 1000mg sodium/cube…except for the hard to find salt-free ones. And lastly, choose the oriental noodles carefully, there are types with as low as 10mg sodium and others up to almost 120mg salt. Vlad, your calculations seem a bit skewed. I'm looking at my bottles of Kikkoman right here (which is a pretty major brand of soy sauce) and the REGULAR one is the one that comes in ~900mg/tablespoon... specifically, 921mg/tablespoon. The Kikkoman Less Sodium version comes in at 576mg/tablespoon. Also, I don't think that you're taking into account the fact that the recipe says "Makes 6 1-cup servings" If you take even the 900mg figure for the soy sauce (that allows for the "extra" if you're using less sodium, or just the tablespoon if you're not), that leaves almost 2500mg to be allocated between 3.5 cups of low-sodium chicken broth, chicken breast, noodles, and seasoning. I don't think I missed anything else that might contain salt. At any rate, I think that given those facts, the sodium figure given is quite reasonable - for the serving size given. If you're more likely to eat half the recipe than a sixth of it, then you need to adjust the figures accordingly.